Some people do not like cases because the aesthetic design of Moto X will be “covered”. You cannot “feel” the phone because of the cover or case. In US, about 50% smartphone user do not use covers or cases. However, if you are thinking about protecting your Moto X from bumps, scratches, smudges and dirt, a case is probably the most sensible solution. Some cases can even protect your Moto X from a drop from 1-2 meters height (to a hard surface). If you ever dropped your smartphone before, the fix for the broken display would easily cost you $100-$300. As most Moto X owners have signed the contract with the carrier for 24 months to get the subsidy, we are expecting to use Moto X for next 1 to 2 years before switching to a new handset. So, if you are worrying about possible damages to your Moto X, you may consider a case. Style. What design do you like? A back case or a flip cover? Black? white? Of course, this is purely personal choice. Weight. Some covers may be heavier than your others. For example, the kickstand will add some weight. Price. It is not necessary to outstretch your budget. 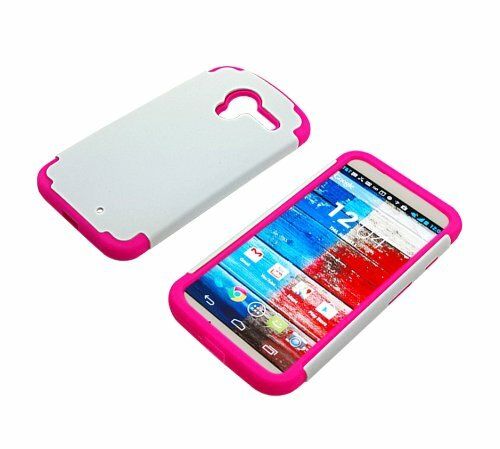 With a few bucks, you can get a decent case for your Moto X. If you have more budget, of course, you have more choices. But please always remember, an expensive price tag does not mean high quality. Choose what you like and what you can afford. i-Blason Motorola Moto X Prime Series Dual Layer Holster Case with Kickstand and Locking Belt Swivel Clip is probably the most affordable dual layer case with kickstand for Moto X.
Dual-layer case is often recommended because of the ideal protection provided. The hard layer provides the strength required for the protection, while the soft layer offers excellent shock absorption and abrasion resistance. This is the reason why the dual layer cases are relatively expensive. The inner enclosure hard shell is constructed from impact-resistant polycarbonate and is double-enforced with a shock absorbing silicone inner-sleeve. The corners feature double-thick silicone for outstanding protection against drops and other impacts.The case also features a built-in kickstand, which is useful for viewing videos or read contents. Most docks work in portrait mode due to the location of the USB port in Moto X. A holster with swirl (180 degrees) belt clip is also included, although some Moto X owners may not use it. Some business travelers may find it quite useful. There are different colors options of this case: black, red and blue. You can purchase them from Amazon directly. 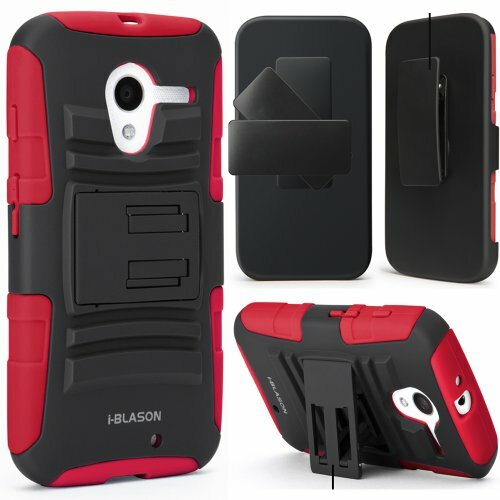 Bear Motion Premium Double Protection PC + TPU Case forMoto X is another hybrid case. Two materials are used: polycarbonate (PC) for its durability and high impact-resistance, and thermoplastic polyurethane (TPU) for its elasticity and resistance to oil, grease and abrasion. This is a no-frill case. No kickstand. No holster. So, it is lighter than the Blason one. The list price was originally $19.99. But now it is at reasonably $6.99. There are 5 different colors to choose from: black, white, pink, purple and blue. OtterBox is well known for their rugged protection cases. OtterBox Defender Series Case for Moto X is a multi-layer protective case that provides rugged protection. Of course, it also includes a holster-style swiveling belt clip. Have you found a case for your Moto X? Let’s know in the comment box below or start a thread in Moto X discussion forum.